Discounted all-day parking is available for CPX! Use if arriving before 10:45 a.m. The closest paid parking is available at the Galvez Lot, shown below. 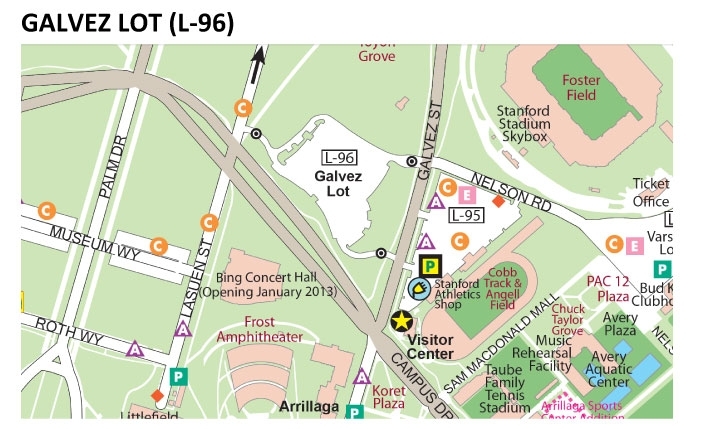 For a full campus-wide look at other Stanford parking options, please click here. 1. Park in the lot and remember your stall number. 2. Proceed to the pay machine. Touch any key to exit intro screen. 5. On the next screen, select (1) for Incremental or (2) for All Day Parking. If arriving after 10:45 a.m., select “Incremental” and skip to step 9 (event code is not applicable). 6. If All Day Parking is selected, select “Yes” when it asks if you have an event code. 9. If incremental rate was selected and paying by credit card, increase the expiration time by pressing the ‘1’ key. Insert your Visa/Mastercard or cash payment. If paying by cash, depositing more money increases the expiration time. 10. Select “OK” to complete transaction and print your receipt. No need to display your receipt on dashboard.